Once an assessment has been completed by students, it will display in the Assessment Manager as “In Progress”, if the testing window is still open, or “Closed”, if the testing window has passed. 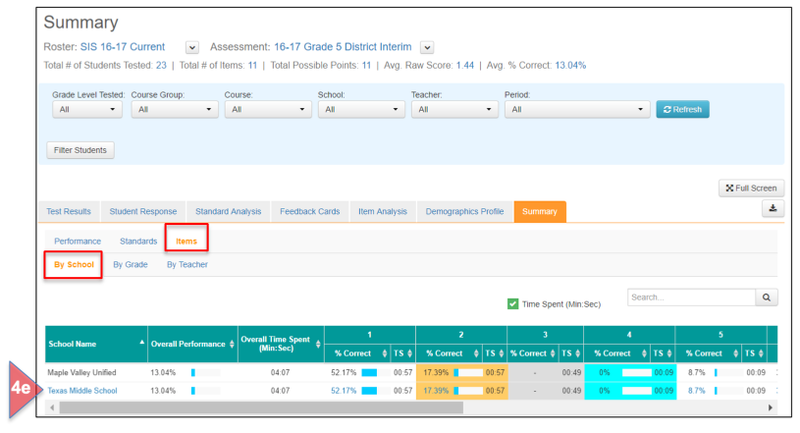 Users with permission may rescore In Progress and Closed assessments, which can include the following: change the point value of an item, change the correct answer or “rekey” the item, select standards or additional standards, and add/revise performance levels. Rescoring allows new reports to be generated, replacing the original set of reports. Admin Level Users: Please see the Help document, System Admin: Permissions for Rescoring, for more information. After selecting the Rescoring icon, the user is taken to the Summary step (Item Bank Assessment), Answer Key step (AKO Assessment) or Assessment Info step (Performance Based A+ Assessment) of the assessment creation process. Standards: Other standards can be selected in addition to those chosen originally. These standards will now be displayed in the Standard Analysis Report. Point Value: Change the points to a higher value or to zero. Click inside the Points box and enter the desired value. This item will be labeled as Point Value Changed in Reports. Constructed Response items: The point value can be changed to zero by using the rubric multiplier and changing the value to 0. This item will be labeled as Do Not Score in Reports. Rekey: The correct answer for an item may be changed. Click on the new correct answer. It will change to red, while the original answer will still show as green. This item will be labeled as Rekey in the Reports. Standards on an AKO/ExamView: Standards can be added or changed by selecting Standards from the ribbon. Select the standards to be included or deselect any standards that should not be used. A confirmation message will appear. Select Remove Standard. Use the dropdowns to add or change standards for specific items. Save: When all changes have been made in the Summary step, click Save. Rescoring Confirmation: A message will appear listing the rescoring options chosen. Click OK to continue. Note that rescoring does not make any changes to an item within the item bank. A second message will appear confirming this action. Click OK to continue. Warning: If the point value of any item has been reset, then the performance level cut points may be updated. Click OK to continue. Next: Click on Next to revise Performance Level. If changes have been made in the Summary step, then the Performance Level set may need to be revised. If no changes to the items have been made in the Summary step, Performance Levels may still be changed, or added, if this step was originally skipped. Add/Revise a Template: Click on Load from Available Templates to either add a set or change the original set. Add/Revise Performance Level Sets: Add a second or third set as desired by clicking on Add Performance Level Sets, then revise as desired. Revise the Description: Rename the levels as desired. Revise the Color Code: Reselect the colors for each level. Revise the Percentages: Setup Performance Level by Percentage and revise the originally selected percentages. Revise the Cut Points: Setup Performance Level by Cut Points and revise the originally selected cut points. Delete a Level: Click on the trash can icon to delete any level. Add a Performance Level: Click Add a Performance Level to either increase the number of levels, or create custom levels. Performance Levels must be created from the lowest level to the highest level. Save: Click Save to save any changes made in the Performance Level step. A message will appear confirming the changes. Click OK to continue. Rekeyed item: An item for which the correct answer has been changed will display with orange highlighting. Do Not Score: An item in which the point value has been changed to zero will display with gray highlighting. All student answers will appear as an omitted response. Point Value Changed: An item in which the point value has been increased or decreased (not zero) will display with blue highlighting. The items for which any rescoring has occurred will display with the same color coding as in the Student Response Report. Items by School: The items for which any rescoring has occurred will display with the same color coding as the other reports.